Named after Janakiprasad, a Kathak exponent originally from Bikaner in West Rajasthan, this school of dancing is also known in some circles as Benaras Gharana. It appears that Janakiprasad went over to Benaras and taught Kathak for the rest of his life there and his school of dance acquired the name Benaras Gharana. Janakiprasad hailed from Mailsur village in Bikaner State. In recent times the exponents of Janakiprasad Gharana have traced his genealogy, which mentions three previous generations of dancers: his father, grandfather and great grandfather. He was born in the family of dancer Gopi-prasad of Mailsur. Gopiprasad had a son named Govindprasad. His son Anandprasad had two children. Of them one was Janakiprasad and the other Chunnilal. Janakiprasad did not marry and went over to Benaras and lived there. He was a great Sanskrit scholar and a very gifted exponent of dance. He created bols, the mnemonic syllables of dance which are pure dance bols known as Natwari bols. These bols mark a distinct variation from the bols of other Gharanas. The Natwari bols of Janakiprasad Gharana are different from the bols of tabla and pakhavaj. The dancers belonging to Janakiprasad Gharana dance to these Natwari bols only. There are also other differences in body postures and execution of dance movements. Chunnilal, the brother of Janakiprasad, had a son called Sablaji. After the demise of Chunnilal, Sablaji went to Benaras to study under Janakiprasad. Sablaji got married and had a son called Dudaji. Dudaji had two sons, Hukmaji and Motilal. They all studied dance under the guidance of Janakiprasad at Benaras. They appear to have returned to Bikaner and sought patronage from the then rulers of the State. At that time Dungarsinhji was the ruler of Bikaner. Dudaji’s son Motilalji became a court dancer. The Maharaja was so pleased with his art that he gifted away a village to Motilal. Motilal unfortunately had no issue. But his brother Hukmaji had two sons, Dularam and Ganeshilal. They carried on the family tradition and studied Kathak under their uncle Motilal, the court dancer. After Motilal, Ganeshilal became the court dancer in Bikaner. His brother Dularam went over to Bihar and became a court dancer in Bitia. Dularam taught Kathak to many dancers in Bihar and had a large following. He also trained his three sons, Biharilal, Puranlal and Hiralal in Kathak and they gave several performances in North India. From among the three brothers, Biharilal served at Indore as a court dancer. After some time he left Indore and came over to Bombay where he joined Gandharva Natak Company of Poona. At that time the legendary tabla player Ahmedjan Thirakwa also worked in the same drama company and used to accompany him on the tabla. Biharilal once again returned to the court of Indore. He was physically so fit that he was able to dance even at the advanced age of seventy-four. The last program he gave was before the Maharaja of Patiala. Then he retired and went over to Sankhu village in Bikaner State where he passed away. Puranlal, the other brother of Biharilal, also followed his brother and he too stayed in Bombay for a long time. Like Biharilal he also taught Menakabai Belgaonkar, mother of the well-known vocalist Shobha Gurtu. Hiralal, the youngest brother of Biharilal, was famous for his compositions of thumris. Hiralal was a court dancer at Bikaner and Indore. He died childless. Of the three brothers Biharilal was very gifted. Among his disciples were the famous artistes: Keshav Rao More of Bombay; Hiralal of Jaipur Gharana, who later on settled in Gaziabad; Pandit Sukhdev of Jaipur, who was a vocalist but loved dance and was the guru of Lata Mangeshkar’s father Master Dinanath, Mohanlal Benaraswale and Menakahai Belgaonkar. Biharilal had three children: Kishanlal, Mohanlal and Sohanlal. None of them is alive today. All the three carried on their father’s tradition. Kishanlal taught along with his father in Bombay. Mohanlal went over to Dehradun where he taught dance till he passed away. Sohanlal also lived in Dehradun. Biharila’s brother, Puranlal, had two sons: Madanlal and Ramlal. They are at present in Patiala. Madanlal has with him the collection of his uncle Hiralal’s thumris. 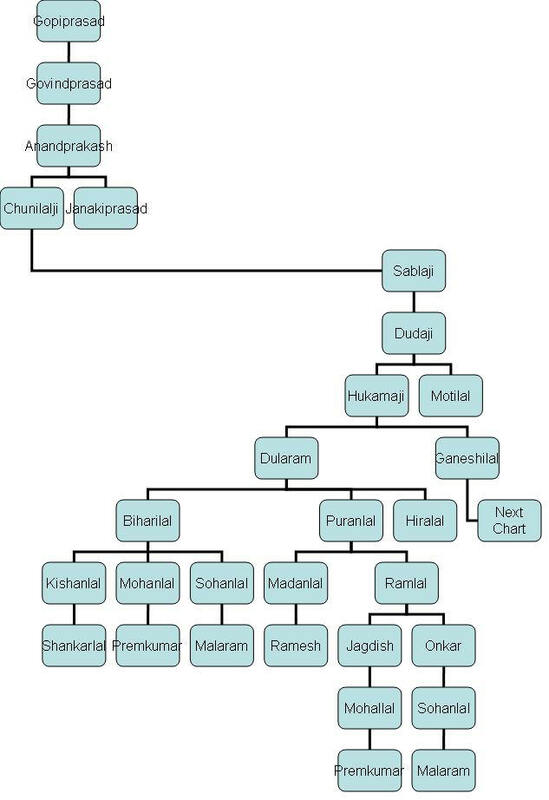 From the family tree, we notice that Hukmaji had another son Ganeshilal. He had three sons: Pandit Hanumanprasad, Shivlal and Pandit Gopal. Hanumanprasad went over to Kashmir and was a court dancer at Jammu during the rule of Maharaja Pratapsingh. When the ruler died he left for Patiala and was received warmly by Maharaja Bhupendrasingh and was made a court dancer. For some time Hanumanprasad was in Nepal as a court dancer when Maharaja Gangasingh was the ruler of Bikaner. After Gangasingh’s death, he continued as a court dancer during the reign of Gangasingh’s son and successor Shardulsingh. Later on he came over to Delhi and trained a number of students. Among many of his disciples were Nirmala Joshi and her sister Uma, who studied for some time under him. Hanumanprasad was eighty years old when he passed away in Delhi in 1952. He was very famous for his abhinaya. In particular, his abhinaya in the composition Sab din hot na ek saman with various sanchari bhavas became legendary. Also abhinaya to the song Jati nagariya main bhuli re dagaria and Sun he taruni sevenhar is well remembered by those who have seen him. Hanumanprasad had one daughter, whose three sons Navalkishore, Bansidhar and Omprasad are in Delhi. Hanumanprasad’s younger brother Shivlal was a poet. But his sons took to dancing. Of the three sons, two, Sukhdev and Durgaprasad, are in Rajasthan and the third, Kundanlal, teaches Kathak at Hanumangarh. The youngest brother of Hanumanprasad was Pandit Gopal who was an equally gifted artist. He spent most of his life in Lahore, though earlier he had been a dancer in the courts of Rajas of Khairagarh, Kapurthala and Kashmir. He was popularly known as Pandit Gopal. His major contribution is making Kathak popular throughout Punjab before the partition. His students became famous dancers, including Hirabai of Patiala Darbar, Nawab Putlibai and Ashiq Hussain. Gopal had adopted Ashiq Hussain as a son and named him Jyotiprasad. But he became famous as Ashiq Hussain. He had performed in several All India Dance and Music Conferences and earned great fame. He was awarded the title of Nritya Samrat in the presence of Alladiya Khan Saheb. He was well known for his abhinaya and layakari. He was also a famous film star of his time and along with his busy career in films he had continued his career as a brilliant exponent of Kathak. Ashiq Hussain had also a large number of disciples who flocked to him for learning Kathak. The renowned dancers Tara Chaudhary and Kumudini Lakhia, one time partners of Ram Gopal, the internationally famous dancer, had studied under Ashiq Hussain Khan. His own brother Sadiq Khan, son Akbar, Pandit Gopal’s son Krishna Kumar, Hazarilal and famous dancers Shahzadi and Hazoori were his students. Ratikant Arya who taught at Deodhar’s school at Opera House in Bombay was also his student. Pandit Gopal’s son, Krishna Kumar, is a brilliant Kathak dancer who was trained by Gopal when he was very young. Later on after the death of Gopal, Krishna Kumar studied under Ashiq Hussain Khan and his own uncle Hanumanprasad. After Independence some of the exponents went over to Pakistan. Most of the old gurus had passed away. From among several exponents of this Gharana, Hazarilal and Krishna Kumar did not migrate to Pakistan. Krishna Kumar is a fine repository of Janakiprasad Gharana. He started a school of Kathak in Bareilly. In 1958 Nirmal Joshi, Secretary of Sangeet Natak Akademi, brought him to Delhi where he partnered Kumudini Lakhia in the dance-drama Malati Madhav choreographed by Lacchu Maharaj. He received Government of India scholarship and studied further under Shambhu Maharaj. He also choreographed various dance-dramas on his own like Shan-e-Avadh. Umar Khaiyyam and Senani. He gave dance directions in films and has trained many students. Though of heavy build his movements are light. His abhinaya to sab din hot na ek samana is acclaimed for imaginative sancharis. He lives in Delhi and continues teaching. He also published for some time Swarashringara journal in Hindi on Kathak dance. His son Ashok Kumar is trained as a dancer. In his heydays Hazarilal gave many performances in Punjab, Rajasthan and Uttar Pradesh. He gave up dancing after some time on account of ill-health. But he continues to teach at Bombay at Bharatiya Vidya Bhavan and also at his own institution Natwari. He hails from Bikaner from Agarwal family but has dedicated his life to Kathak. His wife Sunayana has been trained by him. They have also taught to Sanjukta Panigrahi and Kamadeva. Sudarshan Dheer studied under them. Ranjitkar and Dayashankar of Nepal were also Hazarilal’s students. Janakiprasad, the founder of this Gharana, maintained that if the Kathak dancers performed to the bols of the tabla and pakhavaj, then the credit went to the percussionists, for it was to their bandishes or compositions that they were dancing. Therefore he created bols which did not include the bols of tabla and pakhavaj. The dancers of this Gharana dance to t he Natwari bols and compositions. There are twelve compositions in Natwari bols series. This distinguishes Janaki-prasad Gharana from the other Gharanas. Another noteworthy feature is the way of performing tatkar with the heels. There are differences in the positions of the feet and postures. The dance continues on what is called thirkan, and it is here that the bols have kat tarash. Due attention is paid to the execution of the bodily movements according to the sound of the bols. Also angikabhinaya of this Gharana has to be mastered with back to the audience. Of course, this can be achieved by an exceptionally gifted dancer only. In this Gharana the dancers do not execute twenty-seven, sixty-four or eighty-one pirouettes – the chakkars. The bols are so devised that there are no uncalled for chakkars. There are differences in presentation of the thaat and also tatkar – the footwork. Since the bols are not of tabla, the gradual progression of the speed of the bols of tabla and that of dance differ. We have noticed that, essentially, this Gharana is a bifurcation of the Jaipur Gharana since most of the exponents hail from Bikaner. They have been court dancers in Bikaner, Patiala and Indore. However, most of them have retired to Bikaner. The differences in this and the other two Gharanas can best be seen in an actual performance and when one listens to the bols. Both Sunayana Hazarilal and Krishna Kumar have been assiduously following the tradition of their family, and are training their disciples in the specialties of Janakiprasad Gharana.